Takahashi was trained in 'nihonga' or the Japanese-style painting, and drew illustrations for newspapers and textbooks for a living. 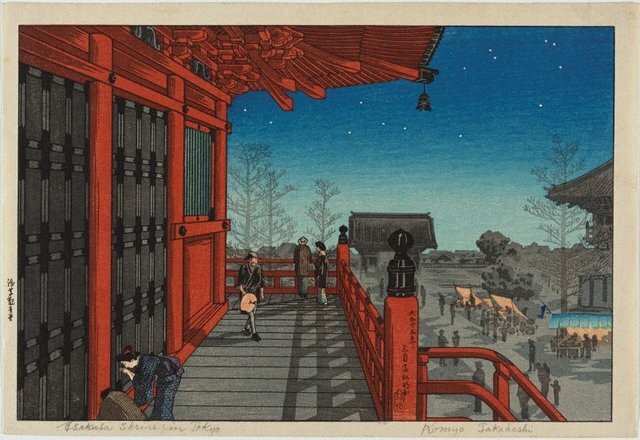 He began collaborating with the print publisher Watanabe Shôzaburô from 1907 producing souvenir prints for export. This collaboration preceded the New Prints - Wantanabe's famous enterprise of producing high-quality prints through the traditional printmaking process, which began in 1915. Takahashi used the 'gô' Shôtei (his real name was Katsutarô) until around 1921 when he changed the name to Hiroaki (also pronounced Kômyô) and developed a more personal style, possibly stimulated by the artistically conscious 'New Print' movement. Signed l.r. margin, pencil "Komyo Takahashi". Dated lower c., black ink, in Japanese "".